The barracuda women’s vela 2 bike is the best answer to choosing a hybrid bicycle as it is perfect in covering all your cycling needs. It has a perfect range for all climbs basing on the previous model only that it is fully adjusted on its stem. 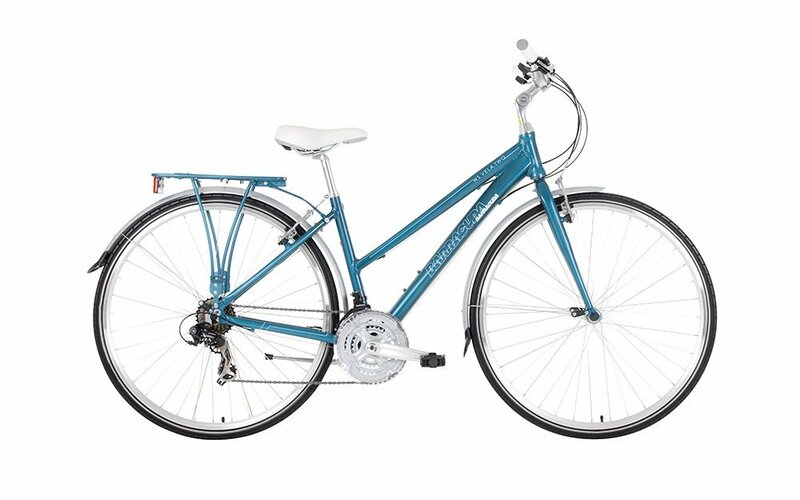 This barracuda women’s vela 2 bike, gives comfort and has a lightweight alloy frame which offers an ideal riding feeling. It also has hydro formed tubes that offer increase in strength and stiffness not forgetting about the weight savings. Has a twenty one-speed shimano gear that makes it easy to use on extreme circumstances like riding fast on roads. This makes the adjusting of the bike gearing easy to allow one keep the pedaling cadence if riding at any speed. The bike is completed with a front and rear mudguards and a rear pannier carrier that makes it suitable for women who are daily commuters. It was made with powerful v brakes that create an efficient power to stop. If the brakes do not function properly, it can easily lead to unavoidable accidents and injuries where some maybe fatal depending on the speed an individual was riding. It has an amazing sports saddle suitable for women who venture in sporting activities that involves bike riding. The saddle for women is mostly designed differently from those of men because they have sit bones that are further apart. Therefore, getting a preferred seat for sports can be necessary to avoid the effects that come due to compression of nerves, or vessels that may lead to nerve numbness when straining your body on uncomfortable seats. Have tyres with trekking patterns of reflective strip front and similar on the rear. This pattern provides rubber blocks that cut into the ground and giving grip especially on slippery muddy roads. Either way different patterns work on different surfaces. Feedbacks from the users of this type of bike prove that they found it friendly to use since their experience with it showed that it met their expectations. Even after long-term use, the daily commuters reviewed it as best and durable. Most of those who use barracuda women’s vela 2 bike found it worth the price they paid for it. More so, it is said to provide the best experience when riding and offers smoothness in gear changing and direction changing. It is also stated to be user friendly due to easy adjustments of seats depending on height. However, few users claimed it not meeting their satisfaction, as they preferred something different like a bike to ride on rough paths. Does barracuda women vela 2 bikes have handlebars that can be adjusted? Due to the flexibility of these handlebars, they can be easily adjusted and rotated as a normal function of a bike. Either way, the handlebars can be easily moved vertically as this is usual in most bikes with flexible handlebars. Why is preferred for commuters? The barracuda women’s vela 2 bike is apparently light in weight and its wheels have properties of a racing bike. This makes it easy and fast in using it as a source of transportation maybe from home to office on a daily basis. Either way, it saves on costs compared to using a personal vehicle that requires fuelling most times or boarding a different means of transport where you will be required to pay for the services. The costs saved when using barracuda bikes can help you meet other needs in daily life basis. Is it ideal for first time bikers? Given that it is flexible, those who love riding as a hobby may opt for it not forgetting the daily basis commuters who need to save on costs. The barracuda women’s vela 2 bike has a smooth steering that serves well and has a wheel designed to fit in racing activities hence making the bike much faster. It gives an excellent experience due to its adjustable structures that allow users to be comfortable when using the bike.